Is someone you love struggling with an eating disorder? 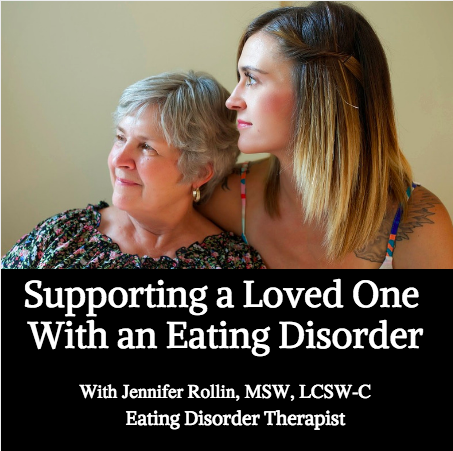 Are you unsure of how to help your loved one who is struggling with an eating disorder? Do you feel at a loss as to what to do? I write and speak about eating disorders and body image issues on Fox, ABC, NBC, PBS, The Huffington Post, Psychology Today, The National Eating Disorder Association Conference, therapy centers, and colleges. I was named as one of the top eating disorder experts in the US by Balance Eating Disorder Treatment Center. Support people can be incredible allies in the recovery process. This on-demand training shares with you the strategies and concepts that I use with the support people of my clients. Topics include: education about eating disorders and the recovery process, questions to ask when interviewing therapists/RDs, what to do when your loved one doesn't think they have a problem and/or doesn't want to get better, treatment approaches, levels of care, what to say and what not to say, specific ideas for how to best support them. For $200 (50% off on Sunday Jan 13th! i.e. $100) you will receive the 52 minute webinar, a handout, and 3 resource lists.